NEW! Digitized PRINT Resource for Class Needs! purchase of the Gale Virtual Reference Library. Primary and secondary resources, once only available in print, are now available for you to discover! Download articles, listen to an audio version of the article, even access the same materials with all of your classmates at the same time: the virtual reference library was designed to meet students' needs. Click the GVRL button above to access. The Comets' Halley! 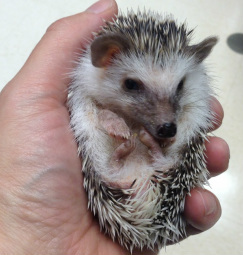 Welcome our new hedgehog!